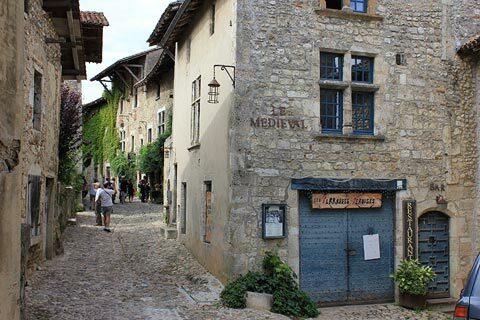 Pérouges is a medieval walled town on a small hill overlooking the Ain river valley, 30 kilometres north of Lyon in the Rhone Alps. 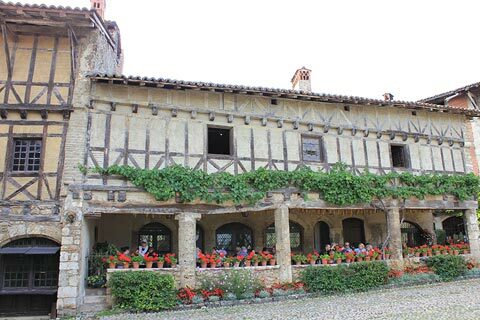 It developed in the 14th-15th centuries based around the local wine and weaving industries. France This Way comment: Perouges is a 'most beautiful village of France' and it really is one of the best of these. 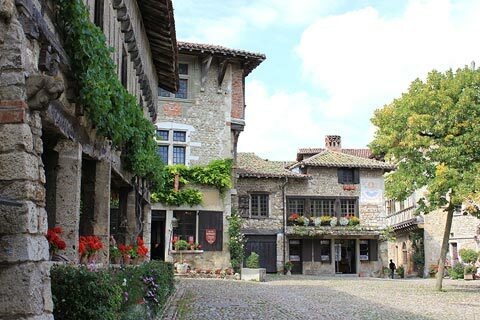 We have visited most of France's classified most beautiful villages and this is one of our favourites. The historic village falls between its two medieval gates - the 'high gate' and the 'low gate'. 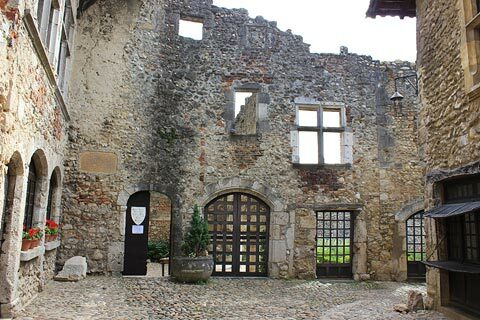 This part of Perouges contains lots of interesting buildings, including a fortified church and the house of the Princes of Savoy (open to the public) with a recreation of a 13th century garden. 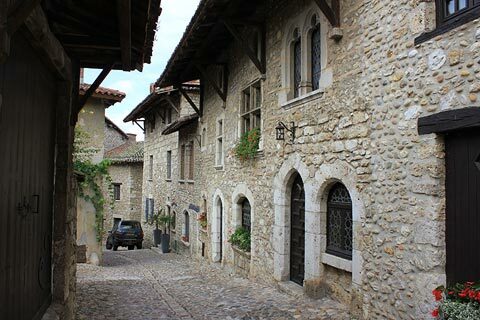 The attractive cobbled streets around the village (these are uneven so wear sensible shoes!) lead past lots of beautiful old stone houses - truly there is something interesting to discover around every corner, with a great deal remaining from its medieval heyday. A tour of Perouges begins at the upper gate. This stone gateway is made of large stones and the wall is part of the church. The church is fortified as are many built at this time (the 15th century). 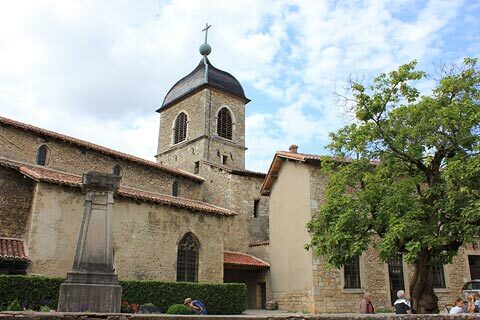 The church was originally built before 1423 but during a siege of the village in 1468 the church was destroyed by the inhabitants of the village in order to repair and improve their remparts. They managed to withstand the attack and one year later started rebuilding the church which was completed in 1479. 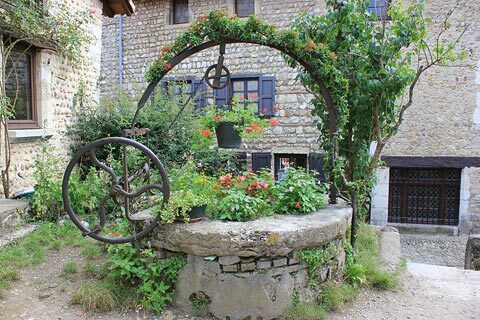 The main street of Perouges is the 'Rue des Rondes' and this runs in a circle around the centre of the village. At one part there is a narrow strip, by the houses, which is higher than the rest and was reserved for the wealthy residents of the village. Below this is the lower part of the lane which would have been frequently covered in mud and rubbish and was for the poor people! As you follow the Rue des Rondes you will pass the 33 meter deep well and the Maison du Sergent de Justice with its round tower. 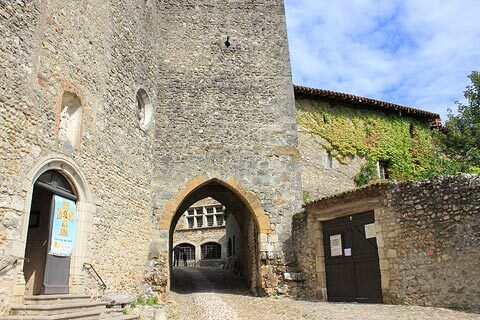 The lower gate was largely destroyed by the 1468 siege and now bears a witty inscription telling how the Dauphiné scoundrels couldn't take the town but made off with the doors, hinges and locks - "let the devil take them"! 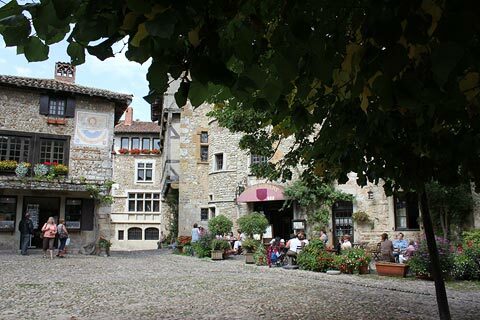 The Place du Tilleul is the centre of Pérouges, with its 200 year old tree of liberty planted soon after the French revolution. Around the square you can see some beautiful buildings, it's a great place to sit and have a beer and watch the world go by. 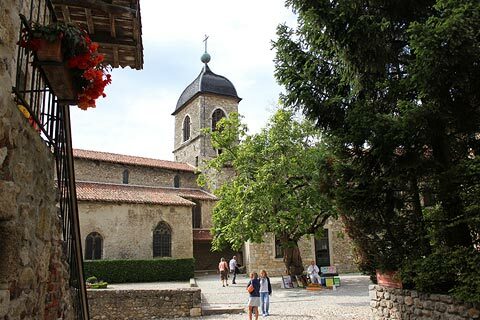 As well as the fabulous buildings look out for the sundial and also take a look in the Saint-Georges church at the wooden Saint George on the altar. 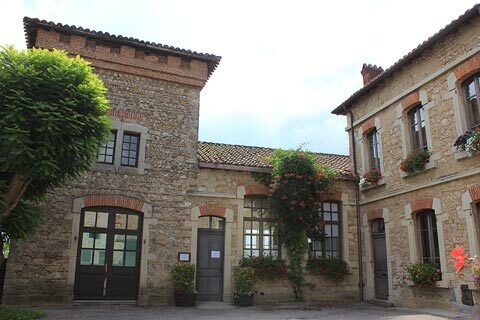 There is also a small museum to commemorate the weaving industry that was once so important in the village. 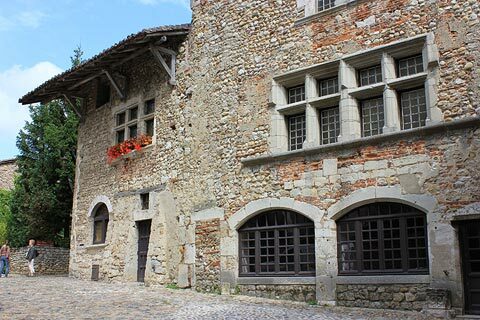 The Rue des Princes leading into the square was the main merchant street and the houses have wide bay windows where the merchants would display their goods. 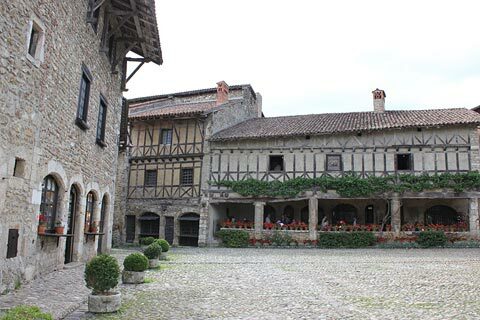 The authenticity of the village has led to various historical films being made there - most notable perhaps being The Three Musketeers in 1973 (with Michael York). 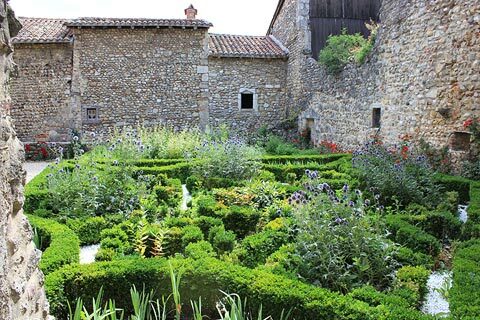 After visiting Pérouges you can explore the Dombes region of lakes and birds to the north of Perouges. Be sure to also allow time to visit Lyon, one of the largest and most interesting cities in France at 30 kilometres south-west of Perouges.